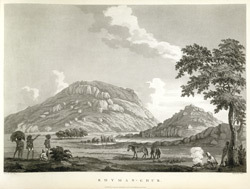 This uncoloured aquatint is taken from plate 9 of Captain Alexander Allan's 'Views in the Mysore Country'. During the third Anglo-Mysore war the fort at Rahmangarh (now ruins on top of a hill in Karnataka), surrendered to Major Gowdie's detachment of the British army in September 1791. According to Allan: "After a few discharges, the garrison demanded and received the usual terms, and the place remained in possession of the English until the peace. The enemy evacuated the forts of Ambajee Ghur and Chillamcottah the day following, and they were taken possession of by our troops."